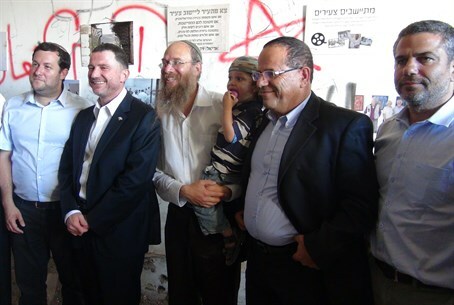 Marking ten years to the town's destruction, hundreds of Israelis on Tuesday visited Sa-Nur, one of four Jewish communities in northern Samaria that was uprooted in the 2005 Disengagement plan that saw Gush Katif in Gaza emptied of Jews as well. Science Minister Danny Danon (Likud) spoke to Arutz Sheva at the event, which was also attended by Knesset Speaker Yuli Edelstein (Likud), Deputy Minister Ayoub Kara (Likud), MK Yinon Magal (Jewish Home), and acting Samaria Regional Council Head Yossi Dagan. "We are here in the Shomron (Samaria) where Jews were uprooted by the government ten years ago. It was a mistake - we need to acknowledge that it was a mistake and we need to correct it," said Danon. "When you come to this place you ask yourself why Jews do not live here. I believe that in the near future we will see the Jewish families coming back to Sa-Nur, coming back to Homesh, coming back to our homeland here in the Shomron." Dagan, who was himself expelled from Sa-Nur in 2005, spoke at the event and said "we will return here." He described the last days before the expulsion, and spoke about the bill that he is helping to advance which would repeal the Disengagement. MK Magal, a member of the coalition, spoke out against the covert freeze on Jewish construction in Judea, Samaria and eastern Jerusalem which has been conducted by the government for roughly two years. "We need to put things on the table: we've never experienced such a difficult period regarding construction," said Magal. "This is the deepest and most severe freeze that we've ever been in."